The Beijing Olympic Torch boasts strong Chinese characteristics, and showcases Chinese design and technical capabilities. It embodies the concepts of a Green Olympics, a High-tech Olympics and the People's Olympics. The torch is 72 centimeters high, weighs 985 grams and is made of aluminium. The torch is of a curved surface form, with etching and anodizing being used during its production. A torch can usually keep burning for approximately 15 minutes in conditions where the flame is 25 to 30 centimeters high in a windless environment. The torch has been produced to withstand winds of up to 65 kilometers per hour and to stay alight in rain up to <?xml:namespace prefix = st1 ns = "urn:schemas-microsoft-com:office:smarttags" />50mm an hour. The flame can be identified and photographed in sunshine and areas of extreme brightness. The fuel is propane which is in accordance with environmental guidelines. The material of its form is recyclable. The torch of the Beijing Olympic Games has a very strong Chinese flavor. It demonstrates the artistic and technical level of China. It also conveys the message of a Green Olympics, a High-tech Olympics and the People's Olympics. The shape of the paper scroll and the lucky clouds graphic, expresses the idea of harmony. Its stable burning technique and adaptability to the environment have reached a new technical level. 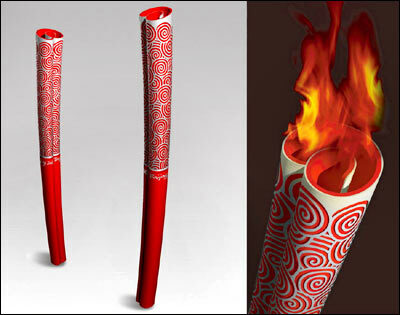 The torch of the Beijing Olympic Games is designed, researched and produced in China. BOCOG owns all intellectual property rights. Under the concept of a Green Olympics, environmental protection was a key element listed in the invitation documents to the design companies, by BOCOG. The fuel of the torch is propane, which is a common fuel which also comes with a low price. It is composed of carbon and hydrogen. No material, except carbon dioxide and water remain after the burning, eliminating any risk of pollution. The burning system of the torch is designed by China Aerospace Science & Industry Corporation. Its stable burning technique and adaptability to the environment have reached a new technical level. It can stay alight in severe weather conditions such as strong wind, rain, snow, hail, etc. The flame can also be identified in sunshine and areas of extreme brightness so as to satisfy the requirements of capturing photographic images and video footage. Validated by IOC, the Olympic Flame will be lit in Olympia, Greece according to tradition on March 25, 2008. From March 25 - 30, the Torch Relay will travel across Greece, ending at the Panathinaiko Stadium, the site of the first modern Olympic Games in 1896. 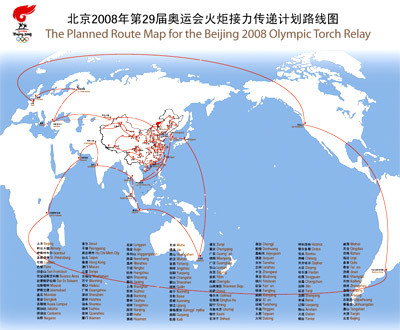 After the handover ceremony in the stadium, the Olympic Flame will arrive in Beijing on March 31, 2008. In Beijing, a ceremony will be held for the arrival of the flame into China and Beijing 2008 Olympic torch relay will commence. Beijing; Almaty; Istanbul; St.Petersburg; London; Paris; San Francisco; Buenos Aires; Dar Es Salaam; Muscat; Islamabad; Mumbai; Bangkok; Kuala Lumpur; Jakarta; Canberra; Nagano; Seoul; Pyongyang; Ho Chi Minh City; Taipei; Hong Kong; Macao; Hainan Province (Sanya, Wuzhishan, Wanning, Haikou); Guangdong Province (Guangzhou, Shenzhen, Huizhou, Shantou); Fujian Province (Fuzhou, Quanzhou, Xiamen, Longyan); Jiangxi Province (Ruijin, Jinggangshan, Nanchang); Zhejiang Province (Wenzhou, Ningbo, Hangzhou, Shaoxing, Jiaxing); Shanghai; Jiangsu Province (Suzhou, Nantong, Taizhou, Yangzhou, Nanjing); An'hui Province (Hefei, Huainan, Wuhu, Jixi, Huangshan); Hubei Province (Wuhan, Yichang, Jingzhou); Hunan Province (Yueyang, Changsha, Shaoshan); Guangxi Zhuang Autonomous Region (Guilin, Nanning, Baise); Yunnan Province (Kunming, Lijiang, Xamgyi' nyilha); Guizhou Province (Guiyang, Kaili, Zunyi); Chongqing; Sichuan Province (Guang'an, Mianyang, Guanghan, Leshan, Zigong, Yibin, Chengdu); Tibet Autonomous Region (Shannan Diqu, Lhasa); Qinghai Province (Golmud, Qinghai Hu, Xining); Xinjiang Uygur Autonomous Region (Urumqi, Kashi, Shihezi, Changji); Gansu Province (Dunhuang, Jiayuguan, Jiuquan, Tianshui, Lanzhou); Ningxia Hui Autonomous Region (Zhongwei, Wuzhong, Yinchuan); Shaanxi Province (Yan'an, Yangling, Xianyang, Xi'an); Shanxi Province (Yuncheng, Pingyao, Taiyuan, Datong); Inner Mongolia Autonomous Region (Hohhot, Ordos, Baotou, Chifeng); Heilongjiang Province (Qiqihar, Daqing, Harbin); Jilin Province (Songyuan, Changchun, Jilin, Yanji); Liaoning Province (Shenyang, Benxi, Liaoyang, Anshan, Dalian); Shandong Province (Yantai, Weihai, Qingdao, Rizhao, Linyi, Qufu, Tai'an, Jinan); Henan Province (Shangqiu, Kaifeng, Zhengzhou, Luoyang, Anyang); Hebei Province (Shijiazhuang, Qinhuangdao, Tangshan); Tianjin; and Beijing. One of the highlights of this leg will be the attempt to bring the Olympic Flame to the highest peak in the world Mt. Qomolangma. During the arrival ceremony for the flame into China on March 31, 2008, one of the lanterns with the Olympic Flame will be kept aside. The torchbearer team will then attempt to take the Flame to the highest peak on a day in May that presents the best climatic conditions for the ascent.